Director/writer Paul Thomas Anderson’s “The Master” is brilliant, beautiful, often unsettling and emotionally devastating. Forget the media shorthand that shortchanges the film by describing it as a fictionalized biography of Scientology founder L. Ron Hubbard. It is much deeper and more artistic than that. This richly rewarding character study, with towering performances by both Joaquin Phoenix and Philip Seymour Hoffman, is a not-to-be-missed moviegoing experience. Numerous similarities exist between charismatic 1950s cult leader Lancaster Dodd (Hoffman) and Hubbard, but audiences expecting nothing more than a snarky names-changed trashing of Scientology and its founder will be pleasantly surprised. Unlike Hubbard, Dodd is not a former science-fiction writer and his methods do not employ mechanical devices such as Scientology’s E-meters. Dodd and Hubbard both believe in space beings, past lives and a universe much older than accepted theory dictates, but Dodd’s method of getting followers to regress and overcome their inner demons involves a mix of sometimes brutal interrogation and what Dodd insists isn’t hypnosis. Unlike “Citizen Kane,” which presented a through-a-lens-darkly yet discernible version of William Randolph Hearst’s biography, “The Master” takes enough departures from Hubbard’s story to seem more inspired by its outlines than shackled to its particulars. Dodd is not even the movie’s main character. That honor goes to Freddie Quell (Phoenix), a mentally disturbed and adrift World War II vet. His job as a portrait photographer at a department store ends in self-sabotaging violence. On the run later from fellow crop-pickers after he accidentally poisons one of them with homebrew liquor, Quell stows away on Dodd’s yacht. There his new life begins. Quell’s exploits as Dodd’s disciple, inspiration, friend, enforcer, surrogate son and possible love interest could be real, alcoholic fantasies or an extended dream. Phoenix gives such an overwhelmingly powerful performance as the troubled psychotic that it’s hard to believe the actor was all but written off by Hollywood after his last movie, the disastrous 2010 staged documentary “I’m Still Here.” Many of his scenes with Hoffman are shockingly intense and frighteningly convincing, including mental-breakdown Q&A sessions and a furiously destructive jail-cell tantrum. capable of delivering a beating, his skepticism about Dodd is outweighed by his miserable, self-loathing neediness. Flashbacks and confessions reveal both the cause of his remorse and the shame he feels about his family history. Dangerous, pathetic and unpredictable, Quell has the volatility of oilman Daniel Plainview from Anderson’s 2007 “There Will Be Blood” tempered with a touchingly hopeless brand of desperation. If Hoffman’s Dodd is a con man, he’s one who has deluded himself as thoroughly as he has fooled his followers. He seems completely sincere about his belief in reincarnation, a universe trillions of years old and the ability to cure leukemia through self-knowledge. His promotion of what he calls “The Cause” has no stated profit motive beyond taking advantage of some wealthy supporters’ generosity, but that’s enough to result in an arrest and fine. 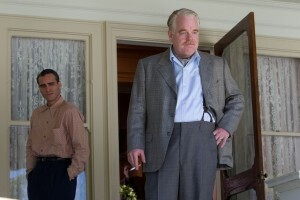 Dodd’s pregnant wife Peggy (Amy Adams) is ruthlessly amoral about supporting the Cause and attacking its enemies, even while Dodd’s grown son Val (Jesse Plemons) tells Quell that Dodd is “making all this up as he goes along.” Quell himself alternates between doubt and fierce loyalty to “the master.” Whether Dodd is so omniscient that he knows Quell’s whereabouts from a continent away, or invades his dreams to reach him by phone, or is only part of Quell’s imagination in that particular scene is left for the viewer to decide. 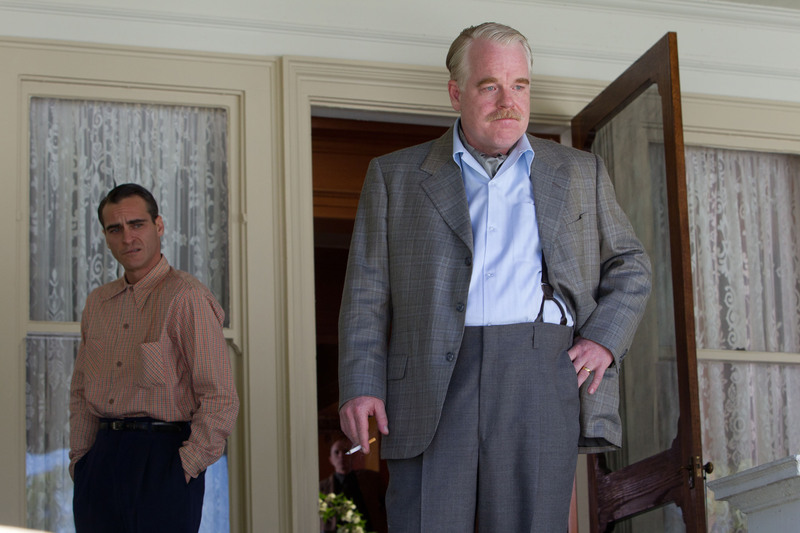 Although guaranteed to receive numerous Best Picture nominations, “The Master” is the kind of genuinely artistic accomplishment that makes award competitions seem absurd. To choose three 2012 movies with nothing in common besides their individual merits, the enchanting “Moonrise Kingdom” is an expertly crafted jewel, “The Avengers” is a ridiculous pop-art masterpiece and “The Master” is a massive semi-abstract monument. All are treasures, but judging them against each other seems as silly as putting Gustav Fabergé, Andy Warhol and Henry Moore in a beauty contest talent show. 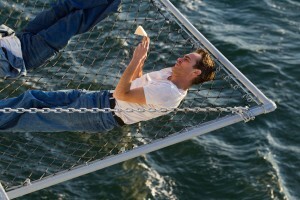 “The Master” obviously is one of the best films of the year, but bestowing an Oscar on it almost would seem superfluous.